Autumn rains came too late to save the stunted stalks of Shu Xinguo’s corn crop, withered by a dry July growing season. Sixty kilometers away, China’s largest aqueduct transports as much as 18.3 million cubic meters of fresh water a day through Shu’s province to quench the growing thirst of Beijing in the north. None of it comes to Shu’s village or any of thousands of farms in the region. With an excess of rain in the south and not enough in the north, China’s solution is as simple as it was expensive: Build three massive aqueducts to divert the water for an estimated cost of more than 500 billion yuan ($76 billion). The result is the world’s most ambitious water transfer program, the South-to-North Water Diversion project. Its middle channel — from the Danjiangkou reservoir to Beijing and Tianjin — was finished in 2014. Proposed in the time of Chairman Mao Zedong, it is a stunning engineering feat. Some 11 billion cubic meters of water has traversed the 1,432-km-long waterway, supplying factories, businesses and 53 million residents. 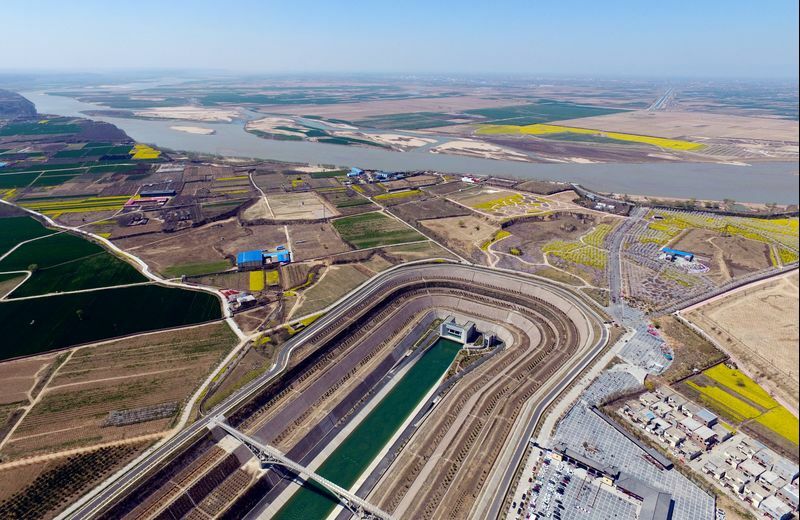 “As the country’s economy develops, industries are using more water,” said Huanguang Qiu, a professor with the School of Agricultural Economics and Rural Development at Renmin University. “And the competition will become even more fierce." President Xi Jinping announced plans in April to build a new city, Xiongan, about 100 kilometers southwest of the capital. With an estimated 5.4 million people, it would also be fed by the aqueduct. Even when the waterway reaches maximum capacity in 2019, China’s demand is growing so quickly that other solutions will be needed. Rivers and aquifers poisoned by years of poor control over fertilizer use and factory effluent need to be cleaned up, waste reined in and offenders punished. The result is a revolution in the ways China uses, monitors and allots its most precious resource. Farms are changing crops and embracing technology to conserve irrigation, industries are being forced to clean up effluent, citizens are taking to social media to report offenders and the government is adapting a long-held food security policy to rely more on imports of water-hungry crops. 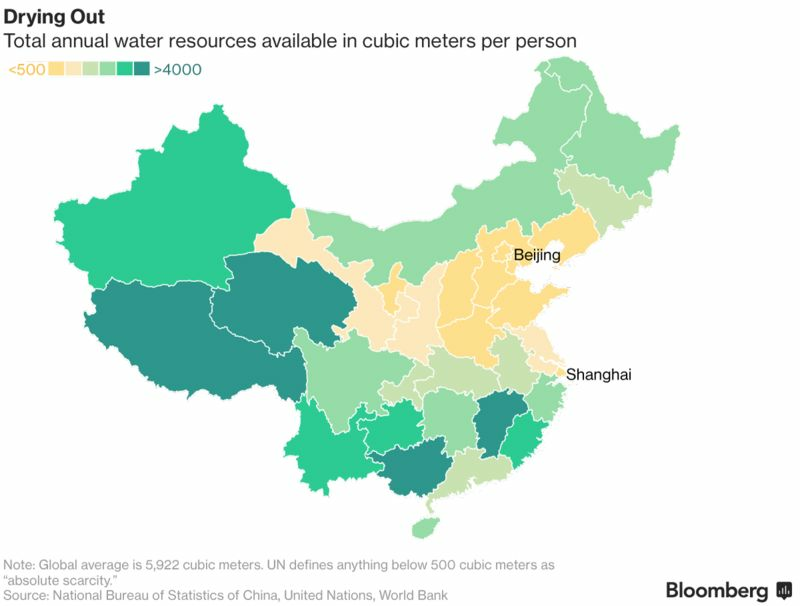 Part of the problem is that China doesn’t just need to find enough water to supply its rising demand, it also needs to replenish aquifers that have been depleted for years. By 2015, 230,000 square kilometers were being affected by over-extraction of groundwater, mostly in the north, leading to land subsidence, sea water intrusion and other problems, the Ministry of Environmental Protection said. The depletion is worst in northern provinces like Hebei, which surrounds Beijing, and neighboring Henan. At least seven giant sinkholes have been reported in Hebei, where farmers have drilled ever-deeper boreholes. The government has promised to divert billions of cubic meters of water from the Yellow River to farms to ease the shortage. 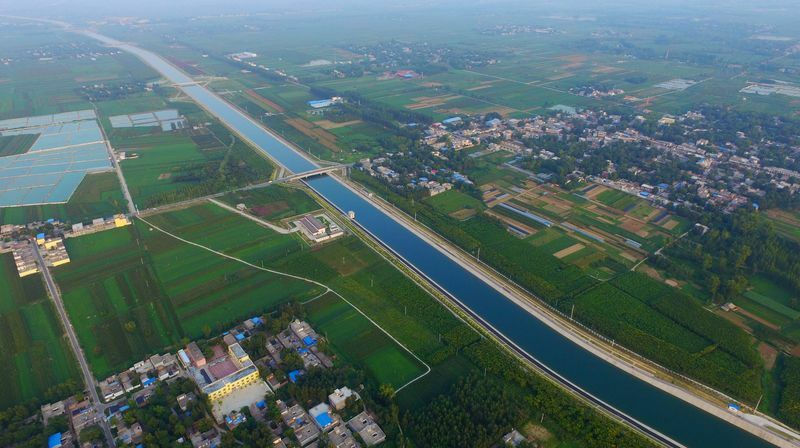 Even so, Hebei could still face a water shortage of 1 billion cubic meters by 2030, Zhang Tielong, deputy head of the provincial water resources department, said when the South-North waterway opened in late 2014. "We should make full use of international markets to increase supplies and should not worry too much over rising imports," said Fang Yan, a researcher with China Institute for Rural Studies at Tsinghua University. She said the government has asked some wheat farmers to shift to water-saving crops. Each ton of imported wheat saves China about 500 cubic meters of water and 0.4 acres of farmland, Fang said. The country is already the world’s largest importer of soybeans, but could buy more, as well as meat and dairy products, she said. But an increase in grain imports would put a further strain on global food markets. China’s soybean demand has prompted farmers in Brazil to turn over some 13 million hectares of farmland and forest to growing the crop in the past 10 years, an area about the size of Germany. In China, urbanization has reduced the amount of farmland in the water-rich south while provinces in the north, which get only 20 percent of the country’s rain, grow more than half the nation’s grain thanks to increasing use of irrigation, she said. Scientists are breeding wheat seeds for the north that need 20 percent less water, said He Zhonghu, a researcher with the Chinese Academy of Agricultural Sciences. With urbanization sucking up most of the supply from the water transfer project, China is turning its focus to better use of the water it has. Some of its biggest technology companies are leading the way. Internet giant Tencent Holdings Ltd. is working with local governments including Shenzhen to encourage the spread of so-called sponge cities — underground reserves and pools on the tops of buildings that catch and store rainwater. The idea was raised in 2015 by the State Council, China’s cabinet, and was mentioned in Tencent Chairman Pony Ma Huateng’s National People’s Congress proposal in March. Tencent is using its three new skyscrapers in Beijing, Shenzhen and Wuhan as pilot projects. Another solution is better irrigation. More water goes to irrigation than any other purpose in China — about 55 percent of the total. Irrigated land produces 75 percent of China’s grain and over 90 percent of cash crops such as cotton and vegetables. Bigger farms are trying new techniques, like Xinjiang Tianye Group’s system that can reduce water usage by as much as 50 percent, according to Chen Lin, the company chairman. Its machines dig rows, lay pipes for drip-irrigation, cover the soil with plastic film to reduce evaporation and punch holes to plant the seeds, all in one sweep. While the technology helps farmers grow everything from cotton to rice, it comes with a hitch: the plastic sheets don’t break down in the soil, leading to widespread pollution. Not far from Shu’s farm in Henan province, Muyuan Foodstuffs Corp. and the local government are building a pilot farm to demonstrate a drip technology from Israel. “Normally, we flood fields with water during irrigation,” said Pang Bo, a manager with Muyuan, as he walked through a white plastic greenhouse that will be used to grow tomatoes. “The drip technology can save water by more than 60 percent.” The facilities cost about 3.3 million yuan for one 0.33-hectare greenhouse with a ventilation and cooling system. To address this, the State Council in January 2016 began to reform the country’s agricultural water tariffs to encourage more efficient use. A national China Water Rights Exchange was set up in June 2016 and a water-rights trading system will follow. The government has set a cap for irrigation of 372 billion cubic meters by 2020. 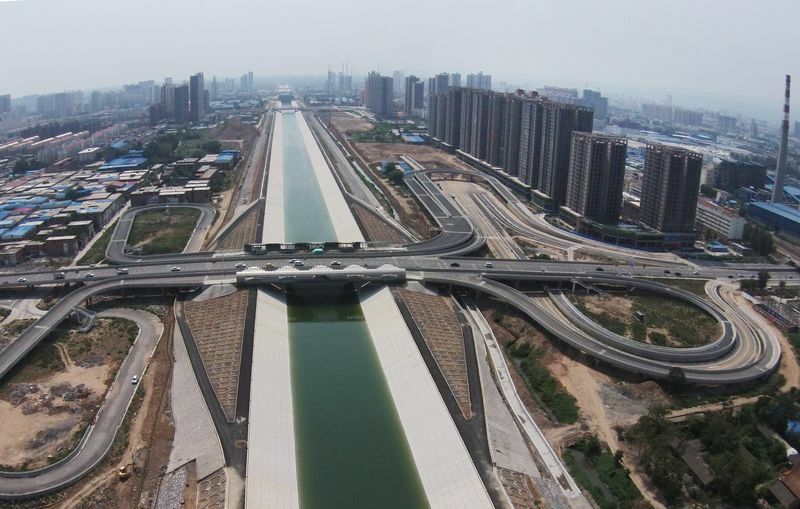 It also has plans for a third canal, supplementing the Danjiangkou-to-Beijing route and the first channel, which largely uses the old imperial Grand Canal system to move water along the eastern seaboard. The western one would divert water from three tributaries of the Yangtze River to help replenish the Yellow River. It is the most controversial and difficult of the three, channeling water across the vast Qinghai-Tibet plateau that could diminish supplies for rivers that flow through neighboring countries to the south. Even as China contemplates such a technological and political challenge, another specter is looming. Recent measurements suggest China’s water distribution may be made even worse by climate change. 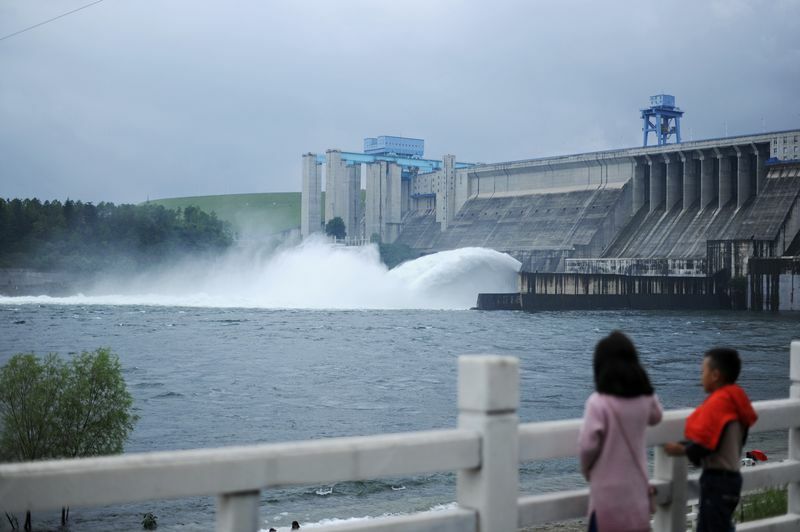 The flow of the Han River, which fills the reservoir at the start of the giant aqueduct, shrank by 7.18 billion cubic meters in the decade to 2010, according to Liu Changming, a water scientist at the Chinese Academy of Sciences. In the nation’s Third National Assessment Report on Climate Change in 2015, the government said rising temperatures and changing rainfall patterns were putting greater stress on agriculture, especially staple crops like rice, wheat and corn. 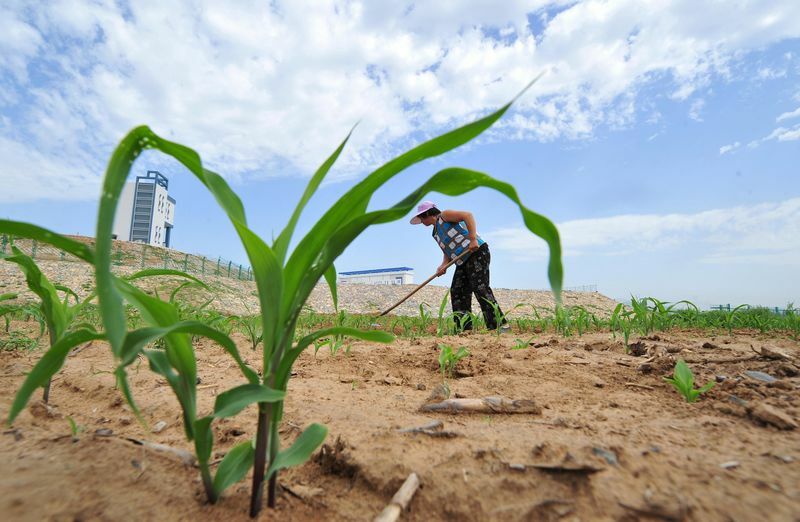 That’s one more problem for Cheng Mingzhen, 66, who grows corn on a small farm in Henan province. She said she can virtually smell the water from the Beijing aqueduct, which passes through her village of Dazhuang. "There is no outlet from the canal,” she said, looking toward the high wire fence that keeps trespassers out. “We can hardly get close to it, let alone get water for the crops." PreviousMeghan Markle Had To Ditch One Of Her Two Dogs Before Moving To England!